President Trump ousted White House chief of staff Reince Priebus and replaced him with Homeland Security Secretary John F. Kelly on Friday, a major shake-up designed to bring order and military precision to a West Wing beset for six straight months by chaos, infighting and few tangible accomplishments. With his legislative agenda largely stalled, Trump became convinced that Priebus was a “weak” leader after being lobbied intensely by rival advisers to remove the establishment Republican fixture who has long had friction with some of Trump's inner-circle loyalists, according to White House officials. Kelly's hiring is expected to usher in potentially sweeping structural changes to the turbulent operation and perhaps the departures of some remaining Priebus allies. Kelly intends to bring some semblance of traditional discipline to the West Wing, where warring advisers have been able to circumvent the chief of staff and report directly to the president and sidestep the policy process, according to people with knowledge of his plans. Kelly, a retired four-star Marine general, earned Trump's approval for his work combating illegal immigration and his leadership qualities, both in the battlefield and at the Department of Homeland Security. Trump has been talking privately about replacing Priebus with Kelly for several weeks now, though he is an unconventional pick to run the White House considering he has no political or legislative experience. Trump first tried to offer the chief of staff job to Kelly in mid-May, according to two people familiar with their discussions. 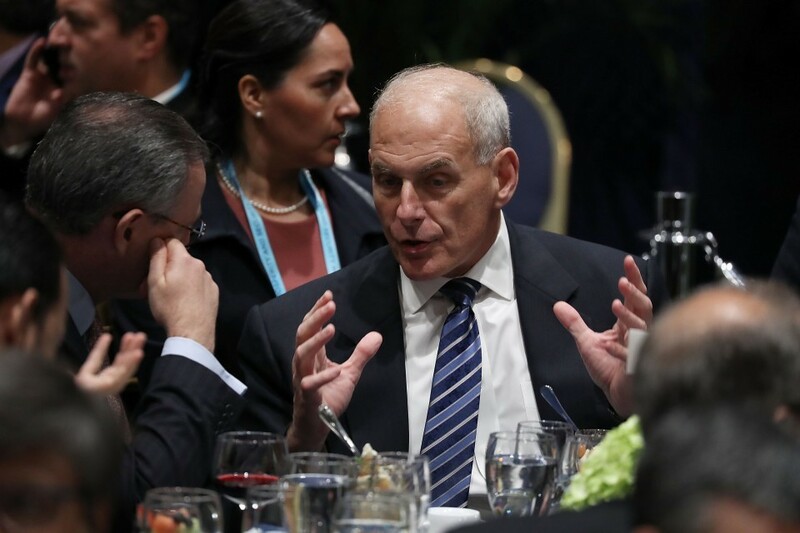 Kelly told the president that he was flattered, but declined, saying he still had more to accomplish beefing up national security and improving immigration enforcement. Trump did not give up, however. "The president has tried to convince the general multiple times, and the general has politely declined several times," said one administration official who requested anonymity because of the sensitivity of the matter. "But given what's going on in Washington, I think the president really needs the general to help him restore order in this White House and advance his vision." The change comes after deep personal animus between Priebus and Anthony Scaramucci, newly appointed as White House communications director, burst into public view Thursday when Scaramucci accused the chief of staff of leaking damaging information about him to the news media and savaged Priebus in a profanity-laced interview with The New Yorker. Priebus' final departure was a humiliating coda for what had been a largely demeaning tenure during which he endured regular belittling from rival advisers -- and even, at times, the president himself. His exit was described by one Republican strategist as "the red wedding," a reference to a mass-murder blood bath episode of HBO's "Game of Thrones." When Air Force One touched down Friday afternoon at Andrew's Air Force base, Priebus, senior policy adviser Stephen Miller and social media director Dan Scavino all loaded into a Suburban. But moments later, Miller and Scavino hopped out of the vehicle, and as word trickled out about the chief of staff's ouster, reporters inched close to snap photos of Priebus, who sat alone on the rain-soaked tarmac. Priebus' vehicle then pulled out of the presidential motorcade, which proceeded along to the White House without him. Trump has long been drawn to military leaders -- “my generals,” he calls them -- and by appointing Kelly, the president hopes to bring military discipline to his often-unruly West Wing. Kelly is expected to be sworn into the job on Monday morning and convene a Cabinet meeting. He is being succeeded at the Department of Homeland Security by his current deputy, Elaine Duke, who will become acting secretary. Currently, Scaramucci reports directly to the president in his role as communications director, as do many other top aides. But two people familiar with Kelly's plans said they expect him to try to require most aides — even those who currently enjoy walk-in privileges to the Oval Office — to report to him, rather than circumventing the chief of staff. Kelly, who is widely admired by Trump family members and loyalists, has formed a bond with the president over recent months that was fortified when he aggressively defended the travel ban policy. Their relationship has only grown stronger since, with Trump telling aides that he sees Kelly as someone who dutifully follows through on his agenda -- including a border security crackdown and sharp reduction in illegal immigration -- and does not cause him problems. Because Kelly has little political and legislative experience, many officials in the West Wing expect that policy issues will largely fall under Vice President Pence’s portfolio, said two people familiar with the likely changes. Pence — who spent Thursday evening in the Capitol unsuccessfully trying to convince Senator John McCain (R-Ariz.) to vote for the Republican health care plan — is expected to serve as a de facto chief legislative adviser to the president, with Nick Ayers, his newly sworn-in chief of staff, and Marc Short, a longtime Pence adviser who is now the White House director of legislative affairs, serving as his deputies on issues of both legislation and politics. Priebus, who as chairman of the Republican National Committee nurtured a close relationship with Trump during last year's campaign, was named White House chief of staff to bring Washington experience to the administration of a political novice. Part of Priebus' pitch was that he could use his long-standing relationships with Republican leaders on Capitol Hill — including House Speaker Paul D. Ryan (R-Wis.), a personal friend — to help pass Trump's ambitious agenda. Members of President Trump's Cabinet met on June 12, 2017 at the White House. After Scaramucci was named communications director last week against Priebus' vehement objections, White House officials widely believed that Priebus' position had become more imperiled. His closest ally, press secretary Sean Spicer, resigned in protest last week over Scaramucci's hiring and at a time urged Priebus to consider his own future, officials said, noting that the situation had darkened. Rumors of Priebus' firing have circulated for months now. Trump himself fed the rumor mill, asking friends and other advisers to evaluate Priebus' performance and tossing around names of possible replacements. Some possibilities floated by Trump allies included Gary Cohn, the National Economic Council director; Wayne Berman, a longtime Republican fixture in Washington; David Urban, a former Senate chief of staff who ran Trump's Pennsylvania campaign; and Dina Powell, the deputy national security adviser who had a powerful advocate in Ivanka Trump, the president's daughter and White House adviser. For Trump, the imperative to remove Priebus heightened over the past 10 days or so, according to White House officials. Trump's own family had soured on Priebus at least several weeks prior. Jared Kushner, the president's son-in-law and senior adviser, had been telling associates he believed Priebus was doing a poor job and running the White House ineffectively — a view that both Ivanka Trump and first lady Melania Trump also privately conveyed to the president. Inside the White House, Priebus' rivals tried to sow doubts about Priebus' loyalty. Any negative mention of Priebus in a news story — even a single sentence or mere clause — would often elicit frantic phone calls from more junior staffers, the sort of vigorous defense in the media the president came to believe was not afforded to him. The impression within the White House — that Priebus was most concerned with defending his own image — further undercut his standing with Trump and the president’s family. Both Kushner and Ivanka Trump were supportive of Priebus’s departure Friday, but also expressed admiration for Kelly, according to an administration official. Speculation about Priebus' departure began within only a few weeks of his taking office. After dining with Trump at Mar-a-Lago in February, Ruddy publicly criticized Priebus and said Trump was considering making a change. "It's pretty clear the guy is in way over his head," Ruddy told The Post on Feb. 12. On Friday, after Priebus exited, Ruddy reminded The Post that he was the first Trump friend to raise doubts about Priebus. Carol D. Leonnig, Tom Hamburger and Anne Gearan contributed to this story. Abby Phillip was a national political reporter covering the White House for The Washington Post. She left The Post in October 2017.